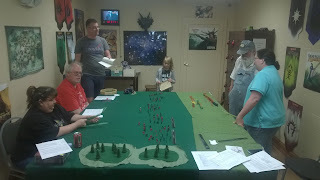 Just last week, the offspring of the authors of Chainmail (1971) got together at Lake Geneva Games to play the classic Battle for the Brown Hills scenario. 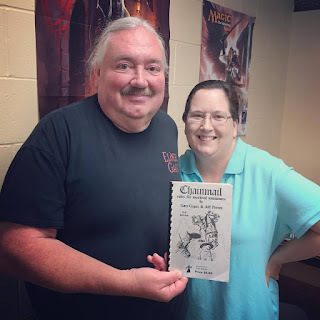 Chainmail is a medieval miniatures wargame created by Gary Gygax and fellow Lake Geneva Tactical Studies Association (LGTSA) member Jeff Perren, a hobby-shop owner with whom Gygax had become friendly. The game was first published in 1971 by Guidon Games. That first edition also included a fantasy supplement, and is one of the oldest sets of rules for fantasy miniature wargaming. Nathan Lyke (who took the first two photos) ran a Chainmail game last Friday at the Lake Geneva Games store with the Son of Gygax (Ernie) and Daughter of Perren (Victoria) in attendance, along with Tom Wham and some other friends playing. 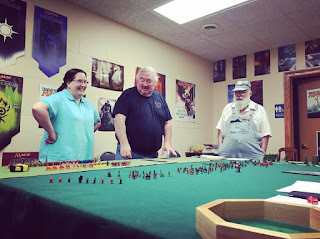 This is the 45th anniversary of the rules being published and what better place to play than Lake Geneva, birthplace of D&D which was guided by these minis rules!